There are other “footprints of pathology” which establish objective evidence of brain pathology. These would include blood pressure, neurological exams, performance based functional capacity exams and brain stem and vestibular testing. Physicians should search for footprints of brain injury. 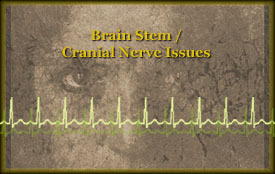 My first suggestion is to fully work up the brain stem/cranial nerve issues in a case. An abnormal ENG or posture platform test by a neurootologist, would be a terribly difficult finding for a defense attorney to dismiss. See the treatment of vestibular problems. The Smell Test: Before a neurologist labels your neurological exam “normal”, make sure they give you the smell test. Damage to sense of smell and related problems with taste, are not only a very common symptom of brain injury, they also correlate to disturbing executive function problems in associated geographic areas of the brain, the orbital frontal area. Significant research points to these orbital frontal problems being central to unsuccessful reintegration of the brain injured person into the outside world. Such problems have a remarkable correlation to serious employability concerns. Varney, The Evaluation and Treatment of Mild Traumatic Brain Injury, Erlbaum, ©1999. Another “footprint of pathology” is what is called a performance based functional capacity exam. Such exams cannot only objectively quantify fatigueability in a brain injury survivor, they also show clear objective evidence of “best effort.” These tests will help determine brain injury and the extent of it. When focusing on the deficits acquired from brain injury it we help for a rehabilitation plan.